The Barcelona clinic liver cancer (BCLC) algorithm is the most widely accepted staging system form hepatocellular carcinoma (HCC). Liver resection is traditionally proposed to early stage HCC (BCLC-0/A), even if recent reports have shown that surgical resection could provide a safe and effective treatment also for intermediate-stage HCC (BCLC-B). In this study, we focused on surgical and oncological outcomes of hepatic resection in BLCB-B patients. Patients who received hepatic resection for early- (BCLC-0/A) or intermediate-stage (BCLC-B) HCC in two tertiary hepatobiliary centers between January 2003 and December 2016 were included in study. Four-hundred and twenty-nine patients were included in the analysis. At the time of resection, 298 patients were classified as BCLC-A/0 and 131 as BCLC-B. 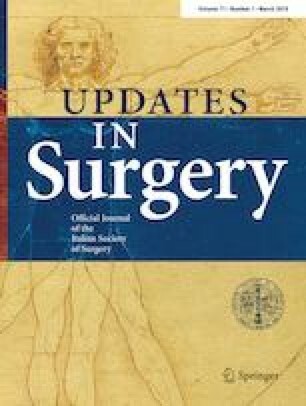 Despite a higher complication rate in BCLC-B group (49.6% vs 32.9%; p = 0.001), the incidence of clinically relevant complications did not differ significantly between the two groups (16.0% vs 10.1%; p = 0.079); moreover, postoperative mortality (4.6% vs 2.7%; p = 0.309) and relapse-free survival (RFS) were similar between BCLC-0/A and BCLC-B group (1-, 3-, and 5-year RFS: 74, 43, and 31% vs 59, 38, and 34%; p = 0.180). Overall survival was slightly worse in BCLC-B group (1-, 3-, and 5-year overall survival of 89, 70, and 52% vs. 77, 51, and 44%; p = 0.004). Focusing on BCLC-B group, a Child–Pugh score B (HR 2.47; p = 0.003), growing number of nodules (HR 3.04; p = 0.003), and R1 resection (HR 2.43; p = 0.005) beard a higher risk of tumor recurrence, while overall survival was negatively affected by the presence of more than two nodules (HR 3.66; p = 0.0001) and R1 resection (HR 3.06; p = 0.0001); patients presenting single-large HCC experienced a better overall survival (HR 0.53; p = 0.014) and lower recurrence-rate (HR 0.60; p = 0.046). Hepatic resection for intermediate-stage HCC shows acceptable results in terms of perioperative morbidity and mortality, with better oncological outcomes in patients with lower number of lesions despite of their size. NTF (Niguarda Transplant Foundation) Research Group has contributed to the study by data management and statistical analysis. The members of the NTF Research Group are listed in acknowledgements. We thank the NTF Research Group, Enrico Pinotti MD [MONZA], Laura Benuzzi MD [MILANO], Isabella Pezzoli MD [MILANO], Maria Danieli MD [MILANO], Arianna Ciravegna MD [MONZA]) for its efforts in data managing and statistical analysis. The members of the NTF Research Group are: Tiziana Cena [NOVARA], Vincenzo Bagnardi PhD [MILANO], Laura Benuzzi MD [MILANO], Isabella Pezzoli MD [MILANO], Maria Danieli MD [MILANO], and Arianna Ciravegna MD [MONZA]. Ethical approval was no necessary because of the retrospective nature of this study. Informed consent was obtained for all the patients enrolled in clinical research studies.